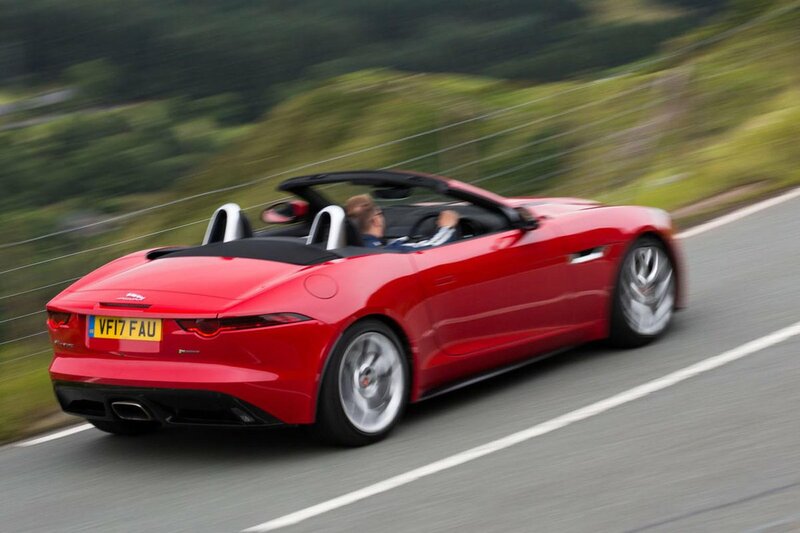 Jaguar F-Type Convertible Performance, Engine, Ride, Handling | What Car? 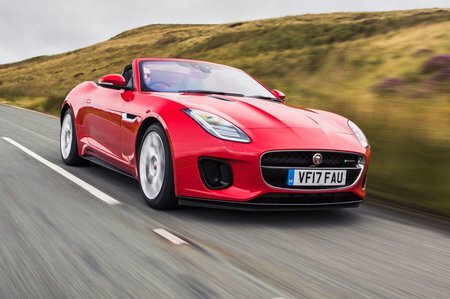 F-Type Convertible buyers can choose from five supercharged petrol engines: a V6 with 335bhp, 375bhp or 395bhp, a 543bhp V8 R, and, in the range-topping SVR model, a 567bhp V8. If you want something a little more frugal, a 2.0-litre turbocharged four-cylinder is available as an entry-level motor. The 2.0-litre feels brisk, but many hot hatches are just as quick, if not faster. This four-cylinder engine begins pulling from around 1500rpm, then revs solidly and steadily rather than particularly keenly to its limiter, which is at around 7000rpm. The base V6 feels more muscular, so it should provide the thrills most buyers are looking for, which is why it's our pick. That said, we see the temptation of the 375bhp version of the V6, because it’s faster still. 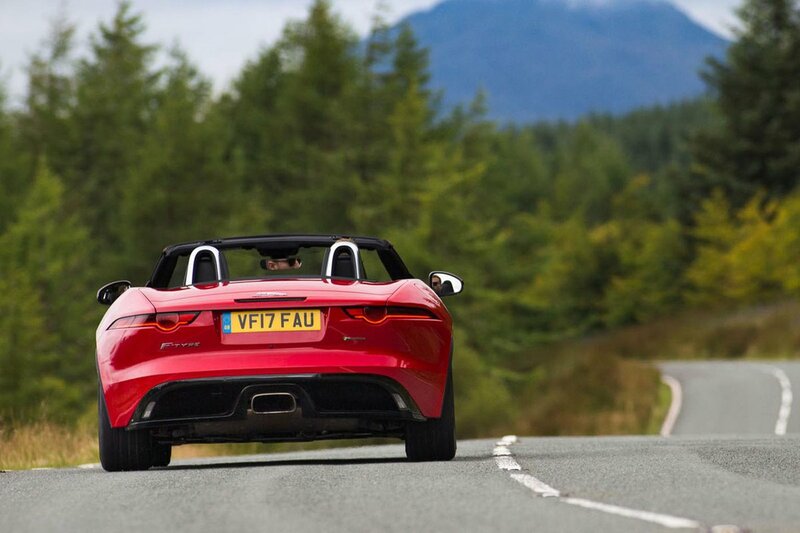 We haven’t tried the range-topping V6, but both V8s make the F-Type very rapid indeed. They are expensive to buy and run, however. The two lower-powered V6s are available with a six-speed manual gearbox. In theory, that's great for a sports car, but its sloppy gearshift isn’t very satisfying; most buyers opt for the eight-speed automatic ’box, and frankly, we don’t blame them. The auto can be controlled manually by pulling on paddles mounted behind the steering wheel, or by nudging the gearlever back and forth. Even this isn’t perfect, though: the shifts are nowhere near as snappy as those of the Porsche 718 Boxster or 911 Cabriolet, either going up or down the gears. Entry-level four-cylinder and V6 versions have conventional shock absorbers, and the result is a ride that’s sports-car firm, but not overly bumpy. It’s never uncomfortable, but you’re always aware of undulations in the road as the car's wheels pass over them. The more powerful V6 models come with adaptive suspension that improves comfort while helping to counteract body pitch and roll. It still feels a little unsettled on scruffy surfaces, but it’s that bit more supple, particularly around town. The range-topping V8 R and SVR also get an adaptive set-up, but it’s altogether firmer and more focused than the V6 S’s, so don’t buy one expecting top-notch comfort. 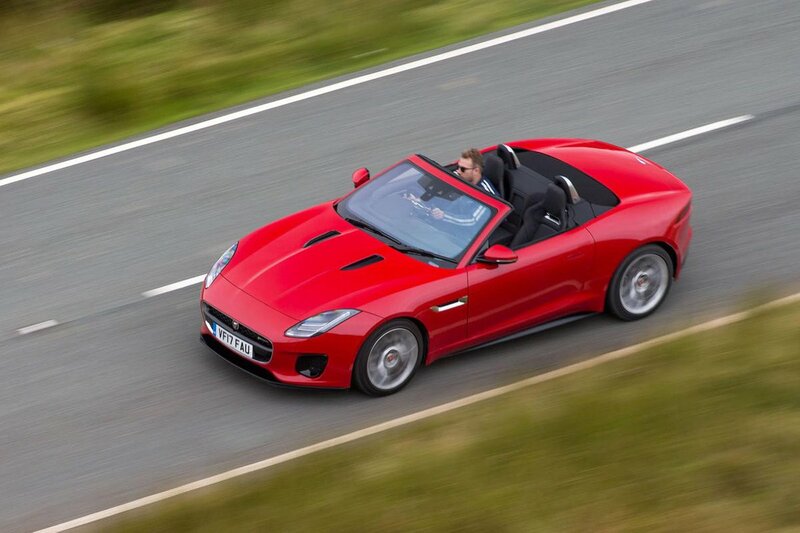 The F-Type Convertible is heavier than the 718 Boxster and 911 Cabriolet, and you feel that on the road. It doesn’t respond as quickly to steering inputs, and you’re more aware of its weight loading up onto the outside wheels when you turn in to bends. Being around 52kg lighter, you feel this least in the 2.0-litre four-cylinder entry-level model. Start attacking corners with gusto and you’ll appreciate the preciseness of the F-Type's steering, although to really rival the confidence–inspiring helms of the 718 Boxster or 911, it could do with a little extra weight build up mid-corner, and telegraph more of the sensations from the road surface up through the wheel rim to your hands. Rear-wheel-drive models can feel a little bit lairy in the wet but are great fun in the dry. Four-cylinder-engined models doesn’t suffer from this quite as much due to their lower power output. The V6 380 and 400 Sport are both available with four-wheel drive, which makes them much less lively through corners. This inevitably means they’re less fun, but also far more secure and easy to drive quickly – especially in slippery conditions. The V8-engined R and SVR get four-wheel drive as standard. Given the colossal power they have, it comes as something of a relief. In the dry, you have to work very hard to get them out of shape and they can still be driven briskly in the wet. Neither is quite as engaging to drive as the slower V6 models, though. 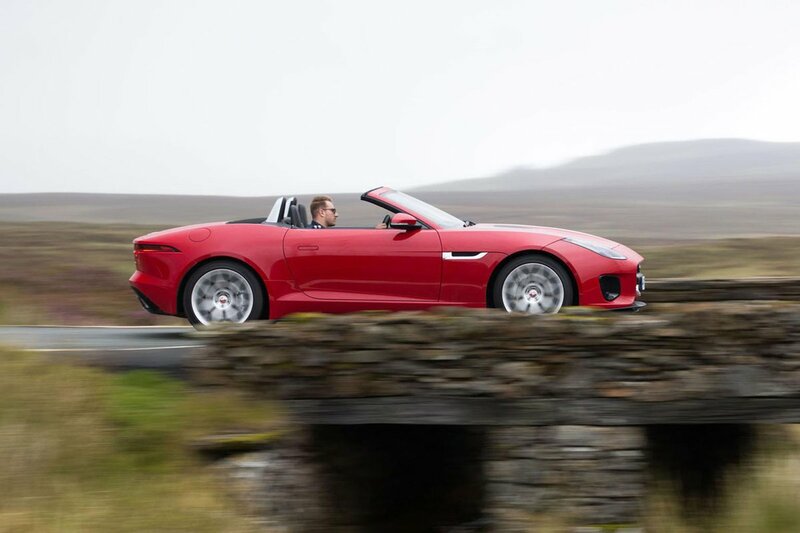 The F-Type Convertible is good at shutting out unwanted noise when its roof is up, while the standard wind deflector, which sits between the rear rollover hoops, ensures that wind bluster isn’t excessive even at motorway speeds when you have the top down. Despite some pops and crackles when you back off the accelerator, the entry-level four-cylinder engine sounds rather monotonous for a car in this class, but then in fairness, so does the 718 Boxster these days. The entry-level V6 doesn’t sound especially tuneful, either, unless you specify the optional switchable exhaust. This feature is standard on the more powerful models. The V6 380 and 400 pop loudly during upshifts and make a glorious crackling noise when you lift off the accelerator, while the V8 sounds even better – it’s so loud when the exhaust is in Sport mode that you wonder how it can be legal.